The Congress family continues to grow and it is happening at the cost of other parties. Continuing with the “switch-over movement”, leaders of the INLD and the HJC, along with their supporters, joined the Congress at the local party office here today. The Sarv Jatiya Sarv Khap Mahapanchayat held here today vowed to fight for their demand for an amendment in the Hindu Marriage Act, banning same gotra and same village marriages. The Haryana State Warehousing Corporation (HSWC) authorities have begun making estimates of the loss suffered at their storehouse at Bani village. As many as 1,70,000 bags of wheat at the storehouse valued at Rs 11 crore had come under 10ft to 12ft-deep waters following breaches on the right embankments of the Ghaggar that flooded several villages. 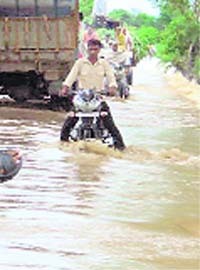 The district administration needs to make arrangements on a war footing to avoid fresh floods in the Chhachhrauli, Bilaspur and Jagadhri subdivisions of the district. The situation continues to be grim in around 100 villages with three major breaches in the Som rivulet yet to be plugged. Call it a miracle or blessings of the ‘Baba’, Dashmesh Prakash Gurdwara in Nabiabad in Indri area of Karnal has withstood many a flood year after year. The floodwaters have never entered the gurdwara that stands tall on the banks of the Yamuna. Announcing incentives for government employees, Haryana Education and Health Minister Geeta Bhukkal today said the state government would now bear the expenditure of stationery, school shoes, dress and transportation of the children of government employees. A report in the columns of The Tribune has helped save the life of a meritorious student who, disappointed with poverty, wanted to end his life. He had written to the President, saying he would commit suicide if the government did not provide him assistance for his higher studies. The Blanket Importers and Exporters Association has alleged that it’s members are being harassed by excise officials for the past seven months. They are blamed for tax evasion on blankets, which otherwise is a tax-free commodity in the state. Petrol pumps located outside the city’s limits will remain closed from 10 pm to 6 am. The decision has been taken in the wake of incidents of looting of petrol pumps in the past few weeks. An electrician was buried alive, while seven workers and a son of the house owner were injured when the reinforced cement concrete (RCC) slab of a house under construction caved in here today. A 50-year-old woman of Ashok Nagar in Gannaur was allegedly shot dead by Gopal of Atail village and his accomplice here today. The deceased has been identified as Aruna. Her husband Mahender got seriously injured in the accident. He has been admitted to the PGIMS, Rohtak. A former Civil Surgeon of this district has been booked for cheating after he issued a false certificate of disability to a government teacher. A case under Sections 419 and 420 of the IPC has been registered against Dr SK Batta and a teacher, Sanjay. Mystery shrouds the death of a Dalit labourer, whose body was found at Nandgarh village here today. The deceased has been identified as Vijender from Bahawar village of Sonepat district. A youth lost his life over a bet for a bottle of liquor when he got drowned in a pond at Nirban village in this district today. Local divers searched for his body since morning, but had not found it till the filing of this report. Haryana Minister for Home, Industries, Sports and Youth Affairs Gopal Kanda will receive the Queen’s Baton for the Commonwealth Games on the Haryana’s border with Rajasthan, near Dabwali, in the district on September 26. The Supreme Court has directed a Registrar to register a lease deed executed by the SGPC in favour of Miri Piri Institute with regard to 20.14 acres. With this, the apex court has passed a significant order in favour of the SGPC and the Miri Piri Institute of Medical Sciences Research and Trust. The Commissioner of the Municipal Corporation of Faridabad has convened a meeting of officers of the civic body on August 7 to review the progress of development works. While senior INLD leader and Ambala Zila Parishad member Labh Singh Bhukhari joined the Congress along with hundreds of his supporters, HJC leader Swarn Singh Gola, along with his supporters, including sarpanches and former sarpanches, too, joined the Congress. As usual, Haryana Pradesh Congress Committee president Phool Chand Mullana was there to welcome them into the Congress fold. Mullana attributed this “continuing trend” of Opposition leaders joining the Congress to the “national outlook” of the party. He said people had realised that the interests of all castes were safe with the Chief Minister Bhupinder Singh Hooda-led Congress government. This tilt of leaders of Opposition parties towards the Congress began around the same time last year. As the possibility of an early Assembly election gathered momentum, the search for greener pastures prompted leaders of all ranks to make a beeline for the party even after the elections were announced. Before the Assembly election in October last year, a number of senior leaders of the INLD, including former Finance Minister Sampat Singh, Kailasho Saini and Sushil Indora, and a breakaway group of HJC leaders Subhash Batra and Krishanmurthy Hooda among many others joined the Congress with a lot of aplomb. Interestingly, even after the elections are long over, the Opposition-leaders-turning-Congressmen fad seems to be continuing. The Congress has chosen to see this “movement to its fold” as a barometer of the party’s popularity and an attempt of leaders in Opposition parties at various levels to associate with the party in power. However, the Opposition is not impressed. Sources in the INLD maintain that the leaders moving out of its party are practically “nobodies” who choose to sway in the direction the wind is blowing and won’t think twice before hopping back. “Everybody knows the fate of senior leaders who left us to join the Congress with much aplomb and fanfare. Today, they are nowhere in the Congress scheme of things. Also, this ‘movement’ of small-time leaders is only an attempt of the Congress to ‘misuse’ its power to woo our people and still come out clean. We are neither impressed nor affected,” an INLD leader said. Seeking immediate notification in this regard, the mahapanchayat threatened to bring traffic to a halt (chakka jam) across Haryana on December 21 if the demand was not met by then. Announcing to launch an agitation from the historic Chaubisi Chabutra, the mahapanchayat asked the government to award the khap bodies the status of Lok Adalat. The mahapanchayat saw the participation of about 24 khaps, including the Dahiya khap, Mann khap, Hooda khap, Gathwala khap, Phougat khap, Palam 360 and the Kandela khap. Hundreds of women attended the meeting. In all, seven resolutions were adopted at the meeting, seeking a law providing for stern punishment for marriage within the same gotra and village, granting Lok Adalat status to khap panchayats so that these were bestowed with judicial powers, creation of a new department of culture, inclusion of character-building as a subject in schools, ban on homosexuality, embryo transplantation and surrogate motherhood, provision of law to check cultural invasion through films, advertisements and literature and curb on attempts to tarnish the image of the khap panchayats under the cloak of honour killing. The meeting described the khap panchayats as social bodies which could not be deprived of their social rights. Speakers at the meeting condemned the “negative" attitude of certain sections of society, including the media, towards the demands of the khap panchayats. Former Haryana CM Hukam Singh supported the demand for amendment in the Hindu Marriage Act. Maintaining that amendment in any law could be done within hours if the government wished so, the former Chief Minister questioned the intentions of the those in power over the issue. “Chakka jam” in Haryana on December 21 in case its demands were not by then. Some speakers took exception to the move by the Manmohan Singh-led UPA government at the Centre to enact a law on honour killings, alleging it was a ploy to defame the khaps. 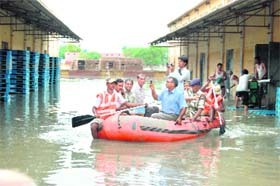 Bani was among the worst-hit villages with over 70 per cent of its houses under water. After the initial blame game between the HSWC and the district authorities over the damage to the wheat stock, the authorities have now started assesssing the exact quantum of loss. Financial Commissioner and Principal Secretary (Agriculture) Roshan Lal and the MD of the HSWC, Krishan Kumar, undertook a survey of the storehouse on a boat. As much as 5,500 metric tonnes (1,10,000 bags) of wheat was lying in the storehouse, while 3,000 tonnes (60,000 bags) was lying on the plinth in the open when the flood waters entered the HSWC building on July 17. 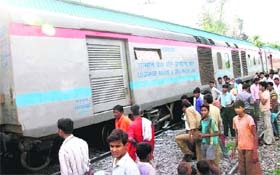 The district authorities had held the HSWC authorities responsible for the loss, alleging that the latter had failed to remove the stock in time, despite being forewarned. Ashok Kumar, a consultant of the FCI had maintained that the wheat rendered unfit for human consumption could be used for animals and birds. The HSWC authorities now maintain that over 70 per cent of the stock might have gone undamaged, despite the deluge. The corporation MD Krishan Kumar said that the process of removal of bags from the storehouse would be started a soon as the water receded further. Meanwhile, the DC, CG Rajini Kaanthan, said six pumps were being used to remove water from Bani village. If the officials do not accelerate the pace of operations, it will take more then a week to plug the breaches and strengthen the embankments. The villagers in these three subdivisions have witnessed floods twice since July 25. They again suffered damages in the overflowing Som and Pathrala rivulets. There was some relief for people living in low-lying areas of the Yamuna with the water level reducing to 30,000 cusecs at the Hathni Kund barrage at 6.30 pm. Around 15,000 cusecs of water is being discharged into the Western Yamuna Canal (WYC), 3,000 cusecs into the Eastern Yamuna Canal and the rest downstream from Hathni Kund. The district administration had sounded high alert in 60 villages in the low-lying areas of the Yamuna yesterday after its water level crossed the danger mark of 91,000 cusecs at the Hathni Kund barrage following heavy rainfall in its catchments areas. Haryana Janhit Congress President Kuldeep Bishnoi, accompanied by party leader Satpal Kaushik, yesterday visited flood-affected areas. He said the government should make appropriate arrangements for the safety of villagers. Most villages did not have power supply or clean drinking water. Union Minister for Tourism Kumari Selja also visited the flood-affected areas yesterday and met the families who lost their children in the floods. She directed the officials to make appropriate measures to help the flood affected villagers. Recalls Arun, a resident of the village: “During the floods in 1978, the entire village was marooned, but not a drop seeped into the gurdwara.” Baba Mehar Singh, caretaker, attributes this to the “miraculous powers” of the late Baba Jagdish, who built the shrine in 1986. An executive committee meeting of the association, was held under the chairmanship of Padamjit Singh, chairman, All- India Power Engineers Federation, here yesterday. It observed that despite the best efforts of thermal engineers and technicians, the quality control of 2X600 mw Hisar Thermal plant was suffering with the HPGCL management ignoring their observations. This had resulted in poor execution of works. RS Dahiya, president of the association, alleged that the contractor, EPC, was not meeting contractual obligations regarding the commercial operation in the given time- frame and engineers were being pressurised to ignore lapses. The meeting, also attended by Raj Kumar Jangra and Hardeep Sangwan, president and general secretary of HPGCL Engineers, opposed the move of the state government to privatise distribution of power in the industrial towns of Gurgaon and Panipat. “These towns have the highest revenue earnings in the state and line losses are low as compared to other circles. “As such there is no basis for introducing the franchise system in the state,” the meeting observed. The engineers condemned the “delaying” tactics of Discoms in finalising its restructuring. The meeting expressed resentment over the delay in rectifying the anomalies in pay scales and upgrading the scales of assistant engineers. Announcing incentives for government employees, Haryana Education and Health Minister Geeta Bhukkal today said the state government would now bear the expenditure of stationery, school shoes, dress and transportation of the children of government employees. She said Rs 3,000 each would be given annually to the employees to meet this expenditure. Talking to mediapersons here, the minister said the state government had taken a number of steps for the welfare of the employees. “A monthly education allowance of Rs 500 is already being given for wards of the government employees and now the government has decided to extend this facility for those children of the government employees who are doing diploma courses from polytechnics,” she said, adding that the decision would benefit lakhs of employees of the state government. To a question, Bhukkal said now the examination of Class VIII would not be conducted by the Board of School Education but by the schools themselves. “Talks regarding the examination fee charged by the board are on with the board authorities and a positive decision in this direction is expected soon,” the minister said. Terming the decision of dismantling the board as student friendly, she maintained it would rid the students of unnecessary tension. To another question regarding the transfer of teachers, she said the list of transfers would be released in a transparent manner under the transfer policy and it would be made available on the website. The guest teachers working in various schools would not be affected by the transfer of the regular teachers, Bhukkal said, adding that the process of filling 35,000 posts of teacher was under way. After months, the President’s office referred the letter to the Home Secretary in September 2009, which finally reached the then Additional Deputy Commissioner Sumedha Kataria for necessary action in the end of November. The Tribune was the first to carry the story on Saurabh (18), a resident of Ambala cantonment on December 2 last. After the publication of the news item, Chief Secretary Urvashi Gulati telephoned Kataria to provide every possible help to Saurabh. After two days she met him and presented him a book of the Bhagwat Geeta, so that he could draw inspiration from it. Several philanthropists came forward to support Saurabh who was given admission in GMN College by principal RR Malik with the college bearing all expenses, though the admission deadline was over at that time. A special permission was granted by the VC in this case. 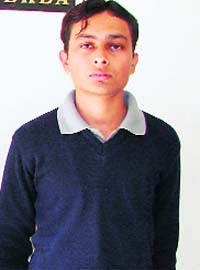 Saurabh proved his ability and secured the first position, securing 78 per cent marks in BCA (first year). A happy Sourabh thanked The Tribune for its invaluable help. He said after BCA, he would enrol for MBA. "My father is not alive. He would have relished my triumph." Sourabh's mother said she would remain indebted to The Tribune, the Chief Secretary and Kataria who had changed the destiny of his son and the family. Laxmi Narayan Gupta, president of the association, said traders imported blankets from different countries to the tune of Rs 400 crore a year on which they paid 28 per cent tax in various forms. This tax was paid as customs duty, excise tax and additional duty after which the imported goods were allowed to be transported to other destinations by the customs officials. Under the Haryana Value Added Tax of 2003, blankets are a tax-free item in the state. However, excise officials deliberately seized their containers, which were passed by the Customs Department. He said this was being done on the grounds that there had been evasion of VAT. The officials had been asking them to produce VAT D-3 forms, but as blankets were a tax-free item, no such forms were issued to them, Gupta said. Pradeep Sharma, another trader, said they were being accused of evading tax and their containers were being held back, causing loss to the business. Mohan Lal Budhiraja, a member of the association, said as per the rules, even if a consignment was detained by the officials, it was supposed to be released immediately after the owners furnished surety bond. However, there had been several instances when containers were held back by the department for more than 10 days even after surety bonds had been furnished. Deputy Excise and Taxation Commissioner Pawan Kumar denied the allegations and said the department had been taking action against unregistered dealers, who were evading tax. The Petrol Pump Dealers’ Association has directed its members, owning filling stations outside the city’s limits, to shut down shops at 10 pm and not keep any cash at the filling stations after closure. A delegation of the members met SP Subhash Yadav here recently to apprise him of the situation following looting of two petrol pumps at Barwala, about 30 km from here, earlier this week. The delegation demanded appropriate security. Yadav suggested that they installed CCTV cameras at the stations to deter looters. Besides, these cameras would help identify the culprits. He assured them that the culprits would be nabbed. However, the pump owners took the decision to shut down their pumps at 10 pm as a precautionary measure. An association spokesperson said it might cause inconvenience to motorists but the step was necessary to safeguard life and property of pump owners and workers. A mason worker has been shifted to Hisar in view of his critical condition. Some construction work was being carried out in a house belonging to a widow in the local Garhi Mohalla and the labourers were trying to place an RCC slab. Sources said one of the walls supporting the RCC slab was very old, some 100 years’ old. Mohinder (21), a private electrician, was also working on the roof to place underground electricity pipes in the RCC slab. Suddenly, the slab caved in as the old wall of the house could not bear its weight. Nine persons, including Mohinder, widow’s son Sachin, two masons - Birbal and Babu Lal - and five labourers Vicky, Renu, Darshan, Champa and Biba, were buried under the debris. Neighbours immediately swung into action and started the rescues operations. SP Jagwant Singh Lamba and SDM JK Abhir also reached there with the fire brigade personnel after getting information. All nine persons were rushed to the general hospital, where Mohinder succumbed to his injuries. Mason Babu Lal has sustained serious head injuries and has been referred to Hisar. Local residents resented against the functioning of the general hospital and alleged that the hospital authorities did not send their ambulance despite several requests. Residents alleged that Mohinder could have been saved had the medical assistance provided to him in time. They also lodged their complaint with Sirsa MP Ashok Tanwar, who visited the general hospital to meet the injured. He also went to Mohinder’s house to express his grief. 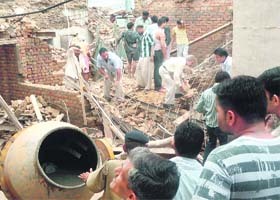 Gopal along with an accomplice entered the house of the victims and allegedly opened indiscriminate fire at the victims. Both were rushed to the Community Health Centre at Gannaur, from where they were referred to the PGIMS Rohtak. Aruna reportedly succumbed to bullet injuries on the way to the PGIMS. On the complaint of her daughter Heena, the police has registered a murder case against Gopal and his accomplice. Meanwhile, in another incident three motorcycle-borne armed gangsters - Jasmer of Joli village, Kuldeep of Dhanana and Sonu of Mehmoodpur - were arrested here today while they were coming to Joli. An exchange of fire took place between the police and the miscreants in which Jasmer was injured. He was admitted to the local civil hospital. DSP Sadhu Ram said the gangsters were wanted by the police in the murder case of Narender Khasa of Gohana. The latter, according to the complaint, joined as a JBT teacher in Faridabad in 2003 and needed a disability certificate for transfer to his home district of Bhiwani. Sanjay allegedly approached Dr Batta, who, not only issued him a disability certificate, but also showed him as a resident of Sirsa district. Sanjay was transferred to Bhiwani district on the basis of this certificate. One Kartar Singh, working as a teacher in the Education Department, hailing from Sanjay’s native village, learnt of the matter. He submitted a written complaint to the then Sirsa Deputy Commissioner.. He asked the Civil Surgeon to verify the complaint. A medical examination found Sanjay completely fit with no disability whatsoever. Following this,, a case of cheating was slapped on Dr Batta. He had been working as a labourer with a local resident identified as Jai Prakash. The victim’s body was found lying on a road in the vicinity of the village. He had gone to the fields last night to irrigate water, but did not return. The victim, Raghubir (22), and his two friends — Bhup Singh and Inderaj — had gone to the village pond for bathing in the morning and decided to have a bet. They decided that whosoever swam across the pond the fastest, would get a bottle of liquor from the other two. The three jumped into the river at about 10 in the morning, but while the other two swam across the pond, Raghubir could not and got drowned. The two raised the alarm when they found Raghubir struggling to stay afloat, but he was drowned by the time any help could reach him. A fire brigade team has also reached the village for helping the divers. The baton will remain in Haryana till September 29, after which it will be handed over to the Delhi government, according to an official release. A cultural programme will be organised in Sirsa after the receipt of the baton on September 26, say sources. Commissioner Mahtab Singh Sehrawat said the meeting would review projects which were under way, including the ones under the Jawaharlal Nehru Urban Renewal Mission.